Latin class taught by Dr. Ted Zarrow. Latin is anything but a dead language at Westwood High School, where 144 students pack classrooms in five grade levels, and dozens more are waiting for a seat. The ancient tongue of rulers, poets, and popes has found new life in a vital local program that offers not just rote declensions of nouns, pronouns, and adjectives — but also an exciting inside look at the roots of language and history. Across the state, 19,831 students in 126 of the state’s 403 school districts — or 6 percent of all students taking language courses — are enrolled in Latin courses, according to the state’s Department of Elementary and Secondary Education. Locally, that includes students in Brockton, Cohasset, Duxbury, Easton, Hingham, Marshfield, Milton, Norwell, Norwood, Pembroke, Plymouth, Quincy, Scituate, Sharon, Silver Lake, Stoughton, Walpole, and Weymouth. Sam Hornstein in Ted Zarrow’s Latin class at Westwood High School. The class has taken on projects such as translating rap and pop songs into Latin. Compared with the 306,928 students enrolled in language courses across Massachusetts, the interest in Latin can scarcely be called booming, a state spokeswoman said. But in Westwood, where more than 600 students study Spanish, 200 take French, and 10 are in an inaugural Mandarin Chinese class, Latin’s appeal has been steadily growing since the arrival seven years ago of Edward Zarrow — a classics scholar with a bent toward bow ties — whose love of the past, and mild civil disobedience, was an immediate fit. 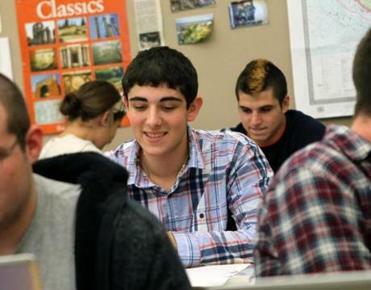 More than 20,000 Massachusetts students take Latin in school. Of the state’s 403 school districts, 126 offer Latin or classical courses. Zarrow’s slightly unorthodox approach resonates with the teens: He has drawn on reenactments of chariot races, the Roman Olympics, and a recent “disastrous” volcanic eruption to re-create the destruction of Mount Vesuvius in 79 A.D. Recently, Latin students held a spontaneous flash mob in the school library that featured 300 of them winding around the tables in a conga line, chanting demonstrative adjectives. Once the concepts click — and Latin’s role in all things becomes clear — learning and understanding expand exponentially, he said. 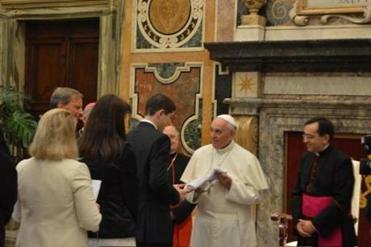 Sam Hornstein, a junior at Westwood High School, meeting Pope Francis in October. 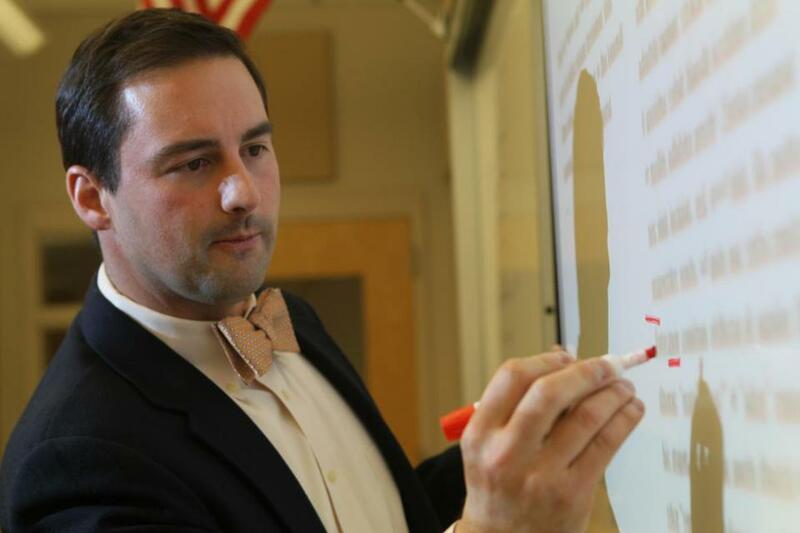 Westwood had a solid Latin program before Zarrow arrived, but its popularity and resurgence is due in large part to the teacher’s knowledge and passion for it, School Superintendent John Antonucci said. Zarrow’s students recently filmed the Latin version of the rap video “Gangnam Style,” by South Korean musician Psy, and Macklemore’s “Thriftshop” — the Latin syllables in perfect synch with the English versions. They have translated and performed Latin versions of Maroon 5’s “Moves Like Jagger,” Rihanna’s “Umbrella,’’ and joined with the school’s chorus to croon holiday standards in Latin from “How the Grinch Stole Christmas” to “Last Christmas,” by the ’80s pop group Wham! Zarrow won the Wolverine Award in 2012, an annual honor the district’s Parent-Teacher Association gives to an educator who consistently uses innovative methods to get youth to learn. His classroom is a throwback to ancient Greece and Rome with a modern twist, blanketed in travel posters, a model of the Colosseum, and busts of Homer and Aristotle — peeking out from under a long brown wig. In a corner, the passenger door to a maroon Dodge van is inscribed with a translation of a passage from the “Aeneid,” Virgil’s epic poem — done by students as a project. Zarrow said he told students they could submit their projects in any way they saw fit and that group took him literally. During a recent class, students were poring over Ovid’s “Metamorphoses,” a long narrative poem that chronicles in part the failed love between mythological characters Echo and Narcissus. Zarrow stood before an overhead screen, highlighting the words as students followed along on ChromeBooks, translating them. Senior Shauna Wassmus, 17, said she started out studying both Latin and Spanish when she got to the high school, but this year had to choose one. “I’ve just found more uses for Latin,’’ she said. Celia Johnston, also a senior, and 17, said Zarrow’s passion for not only teaching the language but also encouraging students to use it “to learn how to learn” changed her thinking. “I quoted him in my college essay,’’ Johnston said. Sam Hornstein, a junior, used his adopted language in an extraordinary way in October during a trip to Rome with his mother, Dr. Abby Hornstein. The two, part of a group of patrons of the Vatican museums, were granted an audience with Pope Francis. Hornstein worked with Zarrow for weeks to come up with some basic conversation he could conduct with the pontiff, whose daily Tweets in Latin have become a classroom staple. The plan was for Hornstein to greet the pope and offer him a Westwood Latin Club T-shirt. Its insignia — Nonnumquam fidelis / semper suavis (sometimes faithful, always smooth) is situated beneath the seal of the city of Boston and the words Bostonia Fortis — or Boston Strong. Hornstein’s moment was just as defining for Zarrow, who said he gave his student a few tricks to keep up his sleeve to help direct the conversation. “I was ecstatic; this was the opportunity of a lifetime for Sam,’’ Zarrow said. Antonucci said administrators are always proud when students want to stretch themselves and represent the schools in unique and special ways. “Wouldn’t it be fun if we see the pope one day wearing his WHS Latin Club T-shirt?” Antonucci asked.